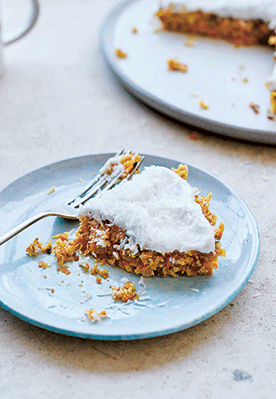 This recipe transforms carrot pulp into a delicious raw cake, and so helps avoid waste. Unlike a lot of raw cakes, this is not loaded with nuts so it leaves you light and fulfilled after eating. 1. Line a 22cm removable bottom tart tin with cling film. 2. Process all the ingredients in a food-processor until well combined, then spread the mixture into the tart tin. Press the mixture well so it is firm and even. Chill in the fridge for about 1 hour. 3. Spread the sweet cashew cream on top and sprinkle with a thin layer of coconut flakes then serve. Place all the ingredients into a high-speed blender with 150ml water and blend until very smooth. If you want the cream to be more liquid, add a tablespoon of water at a time to thin it out. Store the cream in a glass container in the fridge for a maximum of three days. You can make the cake a day in advance, as it will improve in flavour when left in the fridge.